Ballad Health, an integrated healthcare system with a family of 21 hospitals positioned throughout the Appalachian region, is the Official Healthcare, Trauma and Emergency Services Provider for Bristol Motor Speedway, officials from both companies announced today during a press conference. The partnership pledges that Ballad Health's trauma and emergency teams will be ready and equipped to handle any medical emergency situations during BMS events with service provided to both guests and participants. Medical services delivered to guests and participants at the speedway is provided at no cost to the patient or community. "We are thrilled for this partnership with Ballad Health that is tremendously beneficial not only for Bristol Motor Speedway but for the Tri-Cities area and expanded Mountain Empire region," said Jerry Caldwell, executive vice president and general manager, Bristol Motor Speedway. "We applaud Ballad Health's commitment to providing this generous contribution and for delivering outstanding care to the region through their planned regional trauma and emergency care system. The level of excellence Ballad Health provides through their expert medical care gives us great confidence and peace of mind during our fast-paced and action-packed events." "Bristol Motor Speedway is an essential economic driver for our region, bringing a hundreds of millions of tourism dollars into our community annually," said Alan Levine, executive chairman and chief executive officer of Ballad Health. "It's an attraction that brings thousands of people together, and we know that any time there are large crowds of people gathered, it's important for them to know that they can be safe and get help quickly if needed." Ballad Health will staff all major BMS events with approximately 85 medical professionals - consisting of physicians, nurses, nurse practitioners and physician assistants - as well as an estimated 75 off-duty EMS personnel to provide care for all guests and participants. On the BMS campus during race events, Ballad Health provides care in a variety of locations throughout the facility. "We are honored to have the opportunity to serve our communities, and our professionals stand ready to provide a high level of care no matter the medical situation," Levine said. "Our partnership as the Official Healthcare, Trauma and Emergency Services Provider for Bristol Motor Speedway is a symbol of our larger commitment to serving the people of Northeast Tennessee and Southwest Virginia." 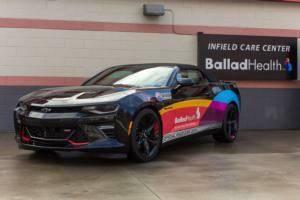 Ballad Health's services will be present April 5-7 at the track's first major NASCAR weekend of the 2019 season, the tradition-rich Food City 500 Monster Energy NASCAR Cup Series race. The event also includes the Alsco 300 NASCAR Xfinity Series race and the Zombie Auto 150 NASCAR K&N Pro Series race. For more information about Ballad Health, please visit www.balladhealth.org. Tickets for all three races during the Food City 500 weekend are still available. Race weekend packages start at just $80 for adults and are $10 for kids. For more information, visit www.BristolTix.com or call 423-BRISTOL.